Cee’s Odd Ball Photo Challenge: Week 17 — please click the link to see detail of this challenge. 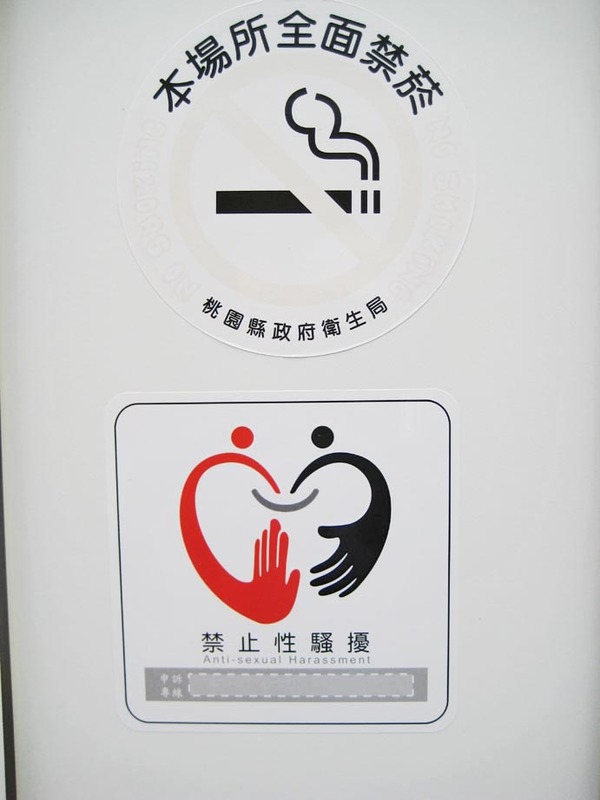 Once when I visited a park in Taiwan (I can still see the place I took the picture, but I don’t have the name for the park), I was quite surprised to see this sign posted inside of the woman’s restroom. (The sign said: Anti-Sexual Harassment. It may be too small for you to read it.) For one, sexual harassment wasn’t something we would talk about when I was still living there. Also, most of the signs, like the non-smoking sign above, don’t have English words in it. And this was the only time I saw a “Anti-Sexual Harassment” sign in a restroom. It was odd enough to catch my attention. I’ve never seen anything like that, Helen. Well-spotted. That’s an odd one all right! Bathrooms often accumulate interesting prose. Thanks, Linda. The first time I went back to Taiwan was 30 years after I came here. I had culture shock 😉 It was a quite interesting trip. Did you grow up in Taiwan? I can imagine that it would have really changed in 30 years. Most places do and returning home is usually a bittersweet event. But I can imagine that the political changes in Taiwan would have accelerated cultural change. You have a wonderful site. I can’t wait to read/see more. Helen, I’m humbled and welcome.